The tiny mouse wandered through the meadow foraging for seeds to eat. Sunshine filtered through the tall grass and warmed his grey fur. Hidden from hawks and eagles, he remained alert. He knew foxes frolicked in the meadow. Even the youngest ones were quick enough to pounce and catch him. His ears pricked up. “Tu-who! Who! 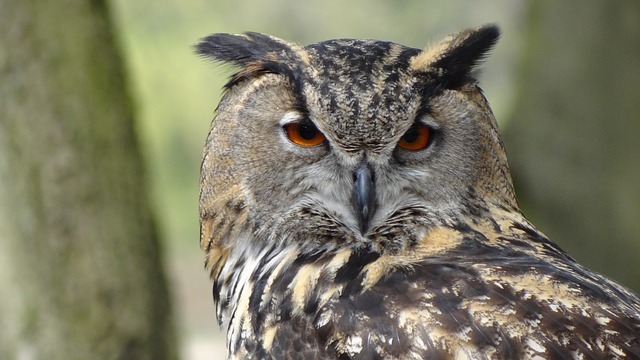 Tu-who!” The mouse knew the call of the horned owl well— owls were not friends to mice. But, the owl slept during the day. To hear one calling in daylight was unusual. The mouse was curious. Instead of running away or hiding, he crept towards the sound. He’d heard children imitate crows and ducks. Maybe someone was imitating an owl? The mouse crept closer and climbed high into a bush so he could see what was going on. He peeked between the branches and saw a Great Horned Owl on the ground, flapping one wing. He noticed the owl’s other wing and both feet were tangled in twine. The owl couldn’t fly and would be unable to hunt. Once again the owl screeched, frantically. A red squirrel skittered by. “Come on, get out of here!” he shouted to the mouse. For a long time, the mouse watched the owl from his hideaway in the bush. The owl tugged at the string to undo it, but the string only grew tighter as he pulled. The owl grew frantic at his inability to fly and exhausted himself flapping one wing. That mice were a favorite menu choice for owls did not comfort the mouse, but he knew he could easily cut the string with his sharp teeth. What a story that would be! How brave others would think him when they heard he approached the great owl, stood next to his mighty talons and survived! The mouse approached the owl. “I can help, if you will allow me,“ he whispered. “Yes,” the mouse said. “But not me I hope.” The mouse did not tell the owl that he imagined lady mice swooning at his bravery. That he might write a book about saving the owl. That he expected all eyes would turn his way wherever he went after his owl adventure. In a few bites, the twine was in pieces and fell from the owl’s wing and from his legs. The mouse scrambled into the high weeds as the owl advised. After that, the mouse told his story about the owl under the summer stars and on moonlit winter nights to all who would listen. Mice from far and near marveled at his daring— speaking to a great owl! What bravery! Who among them would walk so near those sharp talons? Who would dare chew twine from an owl’s wing? And of course, in the mouse’s story, the owl flew away dipping his wings in praise, saying nothing. Published January 26, 2019 Biddeford Journal Tribune (Biddeford, ME).